Like the late Marianne Moore before him, this poet turns to syllabics to provide order to his lines and to offer the backbone of form to a collection observant of less stiff things, like the fluidity of nature, aging, and light. In this, his fourth collection of poems, Kimmelman returns to familiar territory, ruminating on landscapes and intertwining visual arts into his poetic vision. While not all the poems are especially fresh, they still possess a calm that both celebrates and mourns transience, much like ancient Eastern poets Li Po and Tu Fu. Kimmelman, in addition to his books of poetry, also authored two book-length critical studies, and has edited Poetry New York: A Journal of Poetry and Translation, as well as The Facts on File Companion to 20th-Century American Poetry*. He separates this newest collection into three sections. 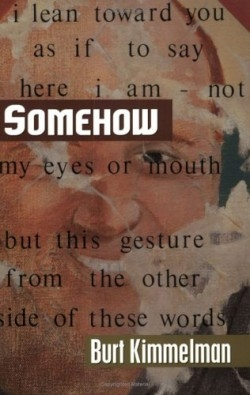 The first section, the “Somehow” of the title, examines existence, connection, and natural order. As in all of the poems, Kimmelman seeks the same metaphors—light, sun, stars, wind, dark, cold, and night—sometimes tiresomely, sometimes movingly. Certainly, the Asian interest in the fleeting beauty of nature appears in poems like “The Evening”: “Rub your leg / with mine, cricket, scrape / the dark heart and pull // on the night’s heavy gown.” The poem begins with a haiku and ends in tight syllabics. The likening of the speaker to the natural world drives the poem. This ability to create a confluence between the identity of the speaker and some object in nature or art produces some of the best poems of the book; indeed, this talent is one of the poet’s gifts, as in a later piece, “Doisneau’s Ballade pour violoncello,” in which an evening rocking his daughter becomes inextricably intertwined with a photo, both lyric moments. The book’s second section celebrates fatherhood as it simultaneously mourns the loss of the daughter of the moment, Jane at three, lost to become Jane at five, then eleven. The melancholy specter of aging lurks somewhere in each poem, making the memory more poignant, particularly for parents reading this work. Occasionally, the language pushes to create moments of singular, quiet intensity, as when daughter “Jane does her jigsaw puzzle. Her / small white hands // smooth over the fractures.” The metaphor speaks ambiguously, as good poetry can. The fractures become both those of the puzzle and those of the father. The book’s final section returns to nature as its symbolic object. Using simple, concise images of nature, Kimmelman records and personifies the late days of each month. Like much of the book, the last section concerns itself with cycles, the processes of aging, death, and rebirth. For readers who want to relax at night and read poems that soothe and celebrate, Kimmelman makes a good bedside companion.